Is it possible to simulate a sheet of trapezoidal sheets? The first option only makes sense if the stresses in the trapezoidal sheet are of interest. It is then mapped with each area of each bead. The modeling effort and the computational effort are very high. The modeling can be a bit easier. 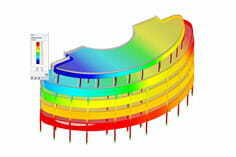 The profile library of RFEM contains all common trapezoidal profiles. If you set a bar with the cross-section of a trapezoidal profile, then you have the opportunity to break the bar into areas. This piece of trapezoidal sheet can then be further modified and copied. If only the stiffness of the trapezoidal sheet is considered, then the use of an orthotropic surface makes sense. When defining the area, choose the thickness type "orthotropic". With the button behind the selection list the orthotropy properties can be defined. The stiffnesses could be defined by substitute thicknesses or directly by the coefficients of the stiffness matrix (see manual). An arbitrary angle for the orthotropy direction can be specified, which refers to the local area axis system. In RFEM, the angle can also be checked graphically (Show navigator, Structure -> Fächen -> Orthotropierichtung).